Welcome, students! I hope you all had a fantastic summer vacation. This year we are going to try something new in my class. I hope you’re ready! In the interest of the environment and preparing you for the future, it is my goal to make my class “paper free”. So why is there a picture of composition books over there, you may ask. Well, until we all start walking around with iPads and tablets every day, we still have to have something concrete to carry around with us. You may be out and about and find an interesting picture of something, or a strange flower, or a neat sign on a store window. You may want to share that with us, and if you have a composition book, you can just stick it in there, or draw it, or glue it. Then we can enjoy it! You can take it home to show the people in your family. You may want to write a poem. Additionally, we will have warmups every day which will require you to write in your composition book. 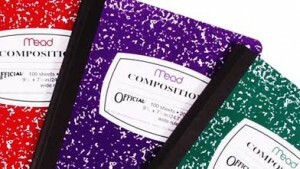 There is also a great chance that you will be writing your FCAT Writes essay on a computer, but until that day, we will be practicing writing them longhand in your composition book. So there it is. Your first homework assignment is to go out and buy one of these! You will need to also have pens and pencils every day, and a cheap set of iPod style headphones is also needed for certain online activities. Please write your name and other important information on the front cover in permanent marker. I will be adding to your homework assignment as the day goes on, so be sure to check back often. « Welcome to the Paper-Free Class Experiment! per.4 mr.hay : my name amanda and its very fun how you put this together and i get it very well. What a neat idea.I love your style.I am certain the kids in your class will like this approach.To go paperless is a fabulous idea..